I was talking lately to my Mom about times when I was a kid and the foods I liked and vehemently hated. She told me something that was a big surprise to me – that I hated every red food. Meaning I couldn’t stand my beloved beetroots!! I remembered that I wasn’t a fan of tomato soup or cooked carrots but I didn't remember the time that I didn’t like either creamy side dish beetroots or the red borszcz (beetroot soup). It’s actually inconceivable for me. I love beets!!! 0_o. Even more remarkable that Cookies ate this soup for the first time last December 0_o. Additionally beets are rich source of antioxidants and minerals like: magnesium, potassium, sodium and vitamin C. They also contain BETAINE that is very important for your cardiovascular health, as it helps to keep your vessels in good condition. 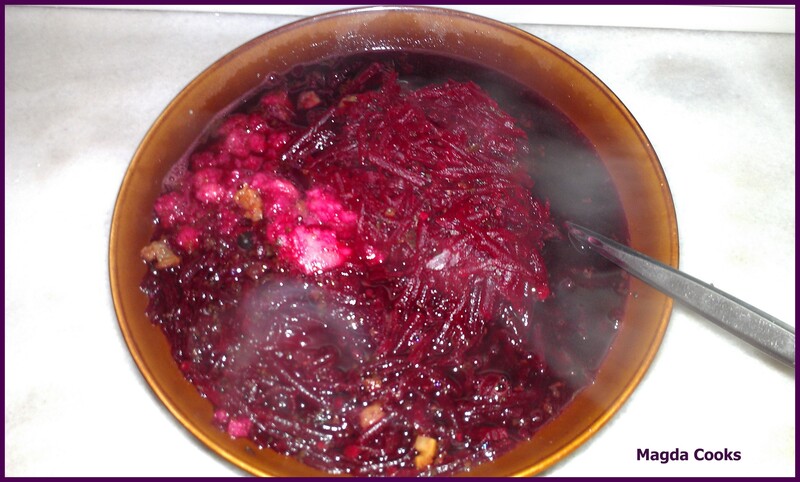 So conclusion is tasty, and healthy therefore, must eat 😉 Today I present a recipe for a very rich in flavor beetroot soup that I learned to make it from my Mom, who is beetroot food specialist. The soup has a wonderful red color, and smells of mayoran. Wash beets thoroughly and cook for 40 minutes with the skin, they should be softer. Let them cool down and peel, then shred it on the biggest edges with your grater. Shred straight to the pot that you will be cooking the soup in. Cover beets with water, add bouillon cubes, garlic, peppercorns, allspice and bay leaves, bring to boil on high heat then lower it to medium and cook for 20 minutes. Add ⅓ of the bottle of beet concentrate - it’s not absolutely necessary - I add it cos I love the deep red/fuchsia color it pulls from the beets. Now is time to spice it: try the soup if it’s salty enough, if not add salt or yellow poison. Add freshly grounded black pepper, a good amount of marjoram and pinch of lovage. Now add juice from ½ of lemon or pinch of citric acid. Try if it’s sour enough. Soup should taste rich, slightly sour, delicately sweet, spicy and aromatic from the marjoram. 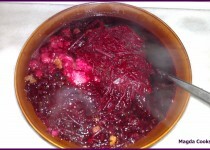 Cook for another 10-15 minutes or until you are satisfied with beetroots softness and the flavour. There is a lot of ways to serve it. As a daily meal I like to serve it as meatless only with creamy mashed potatoes, that you place in the bowl and cover with soup, adding beets generously. You can finish it with splash of sour cream. Next to clear wild mushrooms soup, red borszcz is a traditional dish served for Christmas with small pierogies called uszka or as a hot drink with big sauerkraut/wild mushrooms pierogies. P.S. Cookies thoughts: This was a hard sell, but I broke down and gave it a shot, and I ended up really liking it. Magda Cooks... it just right!